AVAILABLE AT BARRETTS BMW IN ASHFORD AND CANTERBURY BMW. Powerful and athletic. With the presence of an X model and the athleticism of a coupé. 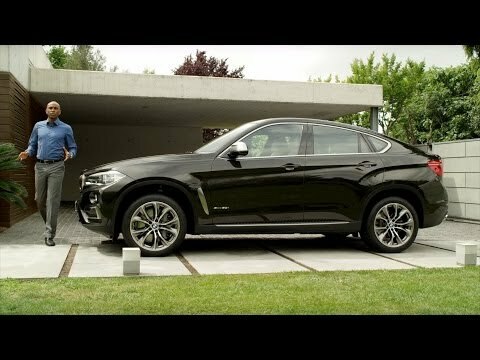 The BMW X6 transcends all limits. THE BMW X6 IN MORE DETAIL. Its BMW TwinPower Turbo engines are a potent mixture of dynamics and efficiency, and BMW xDrive helps to bring this power to the street. Outstanding equipment such as the Design Pure Extravagance package, and top-quality materials make sure this car takes centre stage. The BMW X6 combines the solid stance of an X model with the athleticism of a coupé. The commanding front contains striking air inlets that provide an indication of the power behind them. The large, sporty, double kidney-shaped grille underlines this athletic presence, with an added air of supremacy provided by the double headlights and the fog lights, which are positioned wide on the vehicle’s exterior. When viewed from the side, the sporty, coupé-like silhouette comes to prominence, optically framed by the premium chrome surrounds of the windows. The unmistakable crease line extends from the powerfully shaped wheel front wheel housing to the rear door handles, and then elegantly tapers off towards the rear. The dynamic nature of the BMW X6 is even more prominent across the impressively wide rear, where horizontal lines characterise the solid stance. The BMW X6 is ready to leave all limits behind. Fuel economy figures for the BMW X Series range: Extra Urban 29.4 - 68.9 mpg Urban 16.1 - 54.3 mpg Combined 22.6 - 62.8 mpg CO2 emissions 292- 119g/km. Figures may vary depending on driving style and conditions. Test drive subject to applicant status and availability.